Maybe this is just me but I think G.S 2.0. has had a negative impact on the Yola Community. There seems to be less topics and less interaction from regular users. I myself have noticed that I'm not posting replys as often as I usually would. Also there seems to be an increase in spam on the forum. I would hate for the Yola community to go into decline since it is such a wealth of information and interaction with many friendly people. As I say maybe this is just me but, what do you think? I agree and what they did was destroyed a flow of information.By breaking it up we have little continuity....Sometimes companies need to understand the old adage....If it aint broke don't fix it. Thanks John, now I know I'm not the only one! What they should add is a spam button to alert staff...Of course let them decide if a post is spam or not. Well there is a mark as inappropriate button which probably does the same. First of all, let me apologize for the spam. When you have a paid account with Get Satisfaction you have the ability to remove spam. Yola has such an account and normally we attend to it as fast as we can. However, there was a little glitch and we lost access to our moderation tools, so we had to use the "inappropriate" button instead. I am happy to say that our moderation tools are back and in full working order, thanks to the good people at Get Satisfaction. So if there is any spam, we will be all over it! Spam will quickly kill our forum and we are determined to squash it. You guys can help us by commenting on spam threads (if we haven't deleted them already) and letting these trolls know that you don't appreciate their behavior and that it will not be tolerated. I am also concerned about your feelings regarding the impact of Get Satisfaction 2.0 on our community. Do you feel that even with the addition of the "Recent Activity" tab there are still things you would like to see improved? Let us know what they are and I will call them out to Get Satisfaction. Hi, Connor. I'm the community manager at Get Satisfaction. What's missing with the new update? What do you miss? We've tried to make the new community home page easier to read for the person who just showed up and is looking for the most pressing issues -- and often that is the "most popular" issues. Sounds like maybe you're saying you miss a view that is purely about the most recent activity. But, I'm just guessing. If that is the case, try the Recent Activity tab instead of the Highlights tab. That will show you topics with the most activity. People who are power users (like yourself, it sounds like) often want to see more real-time updates: what's going on now, who's responding -- where the action is, so to speak. We're always keen to hear what people think, so let me know what you think. It's important that we get the opinions of people like you -- the people who are most familiar and engaged with our system -- so please do let us know what you'd like to see. I am going to jump in and say what I miss most. There are a number of things about the new interface that I love, and things I really miss. As a community manager I want to see at a glance what is going on in a community, so that I can know where to focus my attention. So here goes. . .
1) The ability to set a "Message from Yola" with important links. 2) The prominence of Community Participation, showing your own activity, the activity of others and new members. 3) The "search topics" box! 1) The colored ribbons indicating topic type. 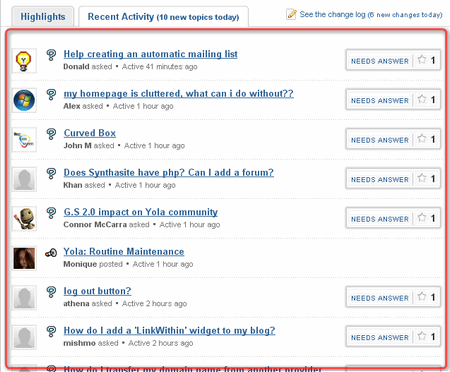 3) Seeing the number of customers and topics at the top of the page. 4) The "People" page. Currently I feel that it is too "buried." Overall I feel that people who are used to the old Get Satisfaction are struggling with the new version. Part of that is to be expected as part of the normal "pain of adjustment." But I have heard from enough people, who have expressed themselves strongly and clearly, that something is "missing" for them. As customers, I am hoping we can do a better job of putting our finger on exactly what this is, as I know you guys are very responsive to feedback. However, for feedback to be valuable to a design team it needs to be as specific as possible. John: you say the flow of information has been broken up. This is a useful insight - can you tell us more? Help us out guys! If you believe that Get Satisfaction 2.0 has had a negative impact on the Yola community, tell us what you miss, or what you think could be changed to bring back the magic for you! As we all are here to help others build great sites we must simply adapt to change and find it within ourselves to see beyond the things which we feel are a negative and assist GS in fine tuning the experience. I think they did a great job and are on the right track but are also expecting each of us to help them make it that much better. I would offer others to follow Monique's fine example and list what they love and things they miss. I wish that I was not so occupied with my current projects as I do so miss spending time in the forums answering as best I can. I think that I am due for some light-bulbs very soon.. Hmmm what can I pull out of the hat today I wonder? Great post Ed! Thanks so much. I love your idea for "favorite threads." I think that would be a nice addition to the "highlights" page. I love that favorite threads idea, Ed! That's fantastic. Would you mind adding that as an "idea" topic in the GS community? I have to admit... when the change took place, I really felt lost. Nothing was familiar anymore. However, once I got exploring and re-learning how this newer forum worked, I felt a little better. 1. Seeing the highlights tab - a great way to get an overview of what's happening in the community. I've enjoyed seeing in particular the following: My community participation, Community Members and "Welcome to our New members". 2. The appearance of the forum seems cleaner now. 1. As Monique & Ed posted above, bring back the ability to see who made the last reply. 3. Remove the "needs answer" - this makes the forum look like they do not answer questions since people do not always mark off "This answers the question". 5. When you use the search box, it only gives you the top 5 answers I think. Whereas before, you could click on a link that would give you "see more answers" or something like that - I'd like to see this feature returned. 6. Allowing users to change "this answered the question" should it not really answer the question. Nice addition my friend. I have always thought that would be a perfect thing to have in the longer threads. Oooh yes! I get the latest alert and then have to hunt for it like crazy if it was a comment somewhere in the middle of a long thread! I agree that that would be super handy. Monique - Just in case you didn't know, when you get an alert, you can get right to the new content by clicking on the "go look at this reply" or "go look at this comment" link from the email, rather than on the topic name link. One more thing to add - I would like to see the "Latest Update" more visible. Either by placing it at the top or highlighting it so that it stands out more. Do you mean the latest Company Update? If so then I agree. That update plays a very important function for us and I find it to hidden at the moment. Ok....let me have a go. I tend to agree with Connor. 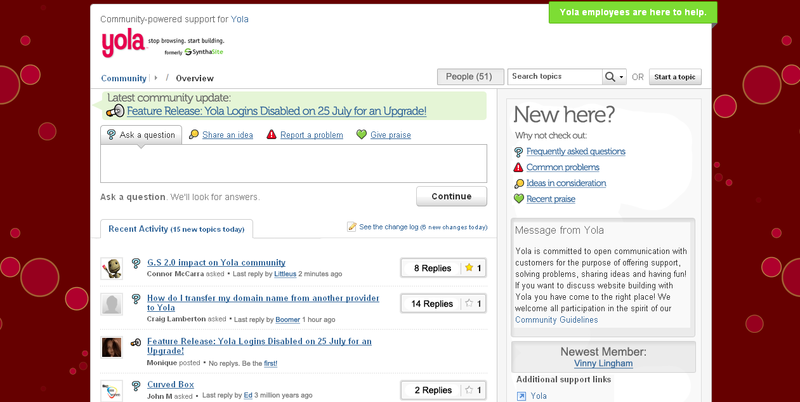 I think GS 2.0 has had a negative impact on the very active Yola Community. 1) All the things Monique, Ed and Littleus love. You make a great point 8 Lu. There is a wealth of suggestions contained in this topic. Thank you for sharing them. I'm asking everyone at Get Satisfaction to take a close look at this topic. Another way to change that would be to provide status to questions (which it currently does not have). Yes please! I must confess I don't know how to get a question to show as answered. Even if I select "this answers" the question, it still shows as "Needs Answer". Feeling a little foolish, but can you explain it to me? Mark it as an Official Response. This is very unclear. The other way it is marked as Answered is if 3 people from the community mark it as the answer. I firmly believe that it would be better that the question is marked as answered if just one user marks it. From my perspective, when I see that a question has been answered, I wouldn't be marking "this answers the question" because it's already been done. This whole thing came up because on one of the threads, a user was assisted on this forum and wanted to mark it as "solved". That person was unable to do so. I would really love to see that ability given to users as I feel it would also encourage more participation as well and feeling a part of the community. I really do appreciate you willingness to listen to our feedback with an open mind and value what we say. Thanks guys! Good point about questions and official responses, Monique! Funny - as a community manager I really love the "needs answer" note because it alerts me that the topic either doesn't have an answer yet or that it does but the reply needs to be marked as the answer, which is part of our job as CMs in our communities but that we often forget to do. I find that it really encourages me to go in and do that kind of "gardening" I need to do to make the community more useful to others. Just to comment on this further... when a forum user click "this answers the question" does this then update the "needs answer" box? Or does the CMs have to tick something off on their end to demonstrate the query has been answered? I think it would save a lot of time for the community managers if forum users can decide if their question has been answered and that it's reflected then in that "needs answer" box. Having said all that though... many users still may not end up clicking the "This question has been answered". But perhaps if we all adopt it and put it into practice.. we'll see this happen more frequently. Perhaps there could be a small tooltip so that when the mouse passes over the section where it says "This answers the question" - it could say something like "if your question has been answered, click here!" One more thing... I'm just thinking of 1st impressions. If a new forum user comes on board and starts to look through the topics.. s/he will see all these so-called "needs answer" for the topics. I just wonder if this may turn off the person from using the forum as they may believe that the support is severely lacking. What about allowing other users who help and comment on the topic can also mark it answered. So if 3 other users mark it as answered then it is put down as answered. The thing is, having the "needs answer" and the "star" right next to the topic allows "1 year old" posts to be continously bumped up to the recently active posts. It's a real pain opening these old posts up just to find someone clicked on a "star" and that there is no added comment to the post. Please, you got to reconsider this. These are all great perspectives. @Littleus: You're right on about your ideas around encouraging members to indicate whether or not their question has been answered or their issue resolved. We're working on solutions to this right now! @Boomer: I beg to differ, I think Monique is a fantastic gardener. I know you think so too. ;) Yeah, I hear you on posts getting bumped to the top when all that's happened is a star or a "me too" click. @Monique: Yeah, I totally sympathize with concern about that impression as well. Particularly in light of your point under the above reply with not wanting to mark things as an "official response" too liberally. @Boomer: One suggestion that I had which I posted at GS, was to make the "star" or "me too" click also have visual clue. Perhaps it can highlight the area where it says "2 people have this question" when that happens? Then, when a reply or comment is made, then the visual cue goes to that section. This way we don't have to waste time looking for the comment when there wasn't any. I do think it's important though that we see these "stars" or "me too" as it gives some kind of indication of what is important to the user or if that experience is being shared by others. @ Littleus: Like I said earlier, I thought your "point 8" was great. This definitely has to be on the "to do" list for GS. Brilliant idea!! As far as the "star" thingy goes, yes, I think it's essential that we have this way of rating topics. I just think it's to easy to inadvertently click on it at the moment. There is a big difference between this two screenshots, mostly the way that the sidebar is on the right in one then on the left in the other. Maybe I'm stupid and being to picky though. Yes, this is up for review. Hi all, we are listening very carefully, and many (possibly most--I haven't counted yet) of your suggestions are underway and you'll continue to see things move in ways that support your wishes. Thanks for the thoughtful input! I think I mentioned this somewhere before, but the new interface has really shown up our failure as Yola community managers to use the moderation tools to their full effect. We don't set the status of problems the way we should, or change topic types when needed. As a result old, solved or answered issues are rising to the surface and it has created a major problem for us. Boomer you are wrong about me. I am not a bad gardener - I do not garden At All! Too busy being a community manager :) So while the gardening metaphor does not work for me, I do see the importance of this and I am a little embarrassed at the current appearance of our community. I have had some intense discussions with our support team about doing better at moderating topics. We have some catching up to do, but please tap us with a reminder if you see us slipping on this! FYI, one our major efforts underway is to improve our resolution system, so we're going to make this a lot easier for you. embarrassed at the current appearance of the Yola community, It's only temporarily I hope. You're the best CM ever. Keep up the good work. If being a gardener was one of my life ambitions I might have been offended. As it is, I find it highly amusing and totally accurate. I do care about being a good CM though, so thanks for the compliment. I really look forward to the improvements Thor refers to because the current appearance of our community does trouble me. However I am patient and I know that good things take time to develop and so do good habits! Remember to click those stars, people! Very cool and very funny Connor! Oh...and Vinny's gonna be pissed! LOL Connor! That's soo great!! I think it really does capture what we're talking about! If it were up to me I'd merge the "Connor GS" with the GS 2.0. I'd keep the left-side and merge the right-hand of the GS 2.0. I think that would be an awesome balance! =)...It's a way for me to know if people actually looked at it closely!